You can use your old Christmas tree as mulch in your garden in several different ways. Run your former Christmas tree through a chipper if you want a traditional type of mulch that can be used to keep other trees warm during the cold winter season. You can also use the needles of the tree as mulch. Since pine needles typically dry quickly but are slow in decomposing, they make for an excellent mulch free of mold for your ground-covering crops. Leaving your old Christmas tree intact can benefit the environment by helping keep soil erosion under control. In the coastal areas that usually experience severe erosion during hurricanes, Christmas trees can be used to prevent the erosion of dunes and even the creation of new ones as the sand gradually covers them up. A simple but effective way to recycle your Christmas tree is to remove all its branches and then line pathways using its trunk. The smaller branches of the Christmas tree can be added to the mulch pile. The mulch derived from Christmas tree provides the ideal surface for the pathways themselves. Edging your paths using old Christmas trees will add a natural aesthetic element and helps nourish the soil and improve the condition of the garden bed as they slowly break down. If you are already into gardening and have your compost heap, you can dispose of the smaller branches of your old Christmas tree by adding it to the compost heap. All you need to do is cut off 6-inch sections of the Christmas tree using hand pruners and then throw them in your compost heap to enrich it. You can use your old Christmas tree to unleash your creativity and give your home a rustic look that you have always wanted. Just cut off thin slabs off the trunk of the tree, sand them down, and then apply some polyurethane to make coasters. Hollow out the stump of your old Christmas tree and then fill it with a scented candle to create a relaxing addition to space. The possibilities are endless. The winter weather usually brings with it harsh conditions, so it is essential to protect your perennials in the best way possible. You can lay the limbs of your old Christmas tree over the existing perennial bulbs and flowers to insulate them against the low temperatures. You can even stick the evergreen branches into the ground to provide a barrier to protecting other plants from the harshness of the drying winter winds. Did you know that old Christmas trees can be a cheap, simple way to enhance soil alkalinity? All you need to do is shake off as many needles from the tree as possible over the garden bed. The needles from Christmas trees are somewhat acidic, which means that they will break down and help balance the pH of alkaline soils if you spread them around plants. Did you know that it is possible to drop off your old Christmas tree at a recycling center? You can even have it picked up from your home. You should check with your city for rules on this or inquire about the Christmas tree drop off areas in your location. The trees are usually sent through chippers to prepare mulch for green spaces and parks. For any such tree care service in Evanston or Chicago you can call us! Christmas trees are highly flammable, and you can use the trunk and branches of your tree to get the flames going in your outdoor fire pit. You can keep the holiday going by gathering around a bonfire on New Year’s Day courtesy of your former Christmas tree. While you can burn the Christmas tree safely outdoors, you must never do it indoors since they contain high levels of creosote that can cause hazardous smoke. Your former Christmas tree can be used for the benefit of animals in the surrounding area. Trim down the tree, drill out the trunk, and then insert your seeds of choice, peanut butter, or even other treats to create a great bird feeder. If you do this, you will not only be giving your bird friends a sanctuary, but it will make for some fantastic bird watching moments. When fully submerged, a whole Christmas tree can protect small fish as well as sites where fish can lay eggs. Old Christmas trees can last about eight years in the water. Some municipalities use Christmas trees to create fish-friendly habitats, but you need to seek permission from the local municipality before you dump your tree into your local creek or lake since having too many submerged trees can lead to problems. If you have outdoor animals such as livestock and a shredder, you can use the tree chips as bedding. If a shredder is unavailable, you can use the branches as bedding for larger animals as long as you add some straw for comfort. Using an evergreen for bedding sometimes help keep insects away too since the smell can repel them. Just make sure that you keep an eye on the animals to be sure that they don’t develop any problems since some animals like chickens usually have adverse reactions to fumes that evergreens produce. Your cats have probably been climbing your Christmas tree throughout the holiday season, so why not consider making it formal? Trim away most branches and leave behind the large, sturdy ones in place. Screw down the wood tightly to ensure that it does not wobble before you upholster using scrap carpet or a different type of material and set your former Christmas tree up on a stable base. Once you burn the wood from your former Christmas tree, gather the ashes and then spread them on the garden. Wood ash contains lime and potassium that help plants thrive, or you can mix the ashes into a compost heap. The ashes are also quite useful in keeping away the insects. Avoid confusing wood ash with coal ash since coal ash does not provide the same benefits. 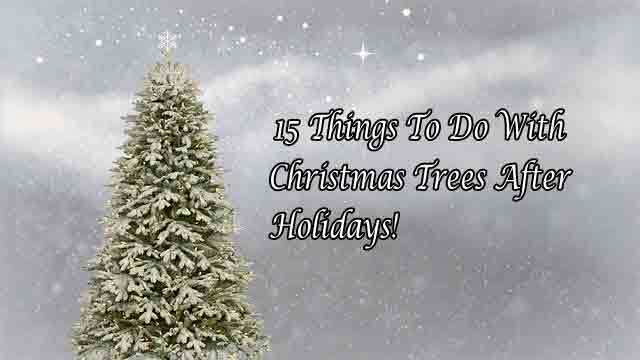 It is possible to freshen up the air in your home naturally using your old Christmas tree. All you have to do is pluck out the pine needles and then add them to a bowl of potpourri so that the distinctive smell of Christmas lingers in your home for the winter. You can also get crafty with the smaller branches by turning them into the coaster, candle holder, and other items as previously stated. You can do so many things with your Christmas tree after the holidays as clearly shown by the 15 amazing ideas discussed here. You can save your former Christmas tree from the sad fate that befalls 33 million others each year of ending up in landfills when there are numerous other ways it can provide benefits. Visit https://www.evanstontreeservice.com/ for any type of tree service requirements.